Yes, we know you typically leave out milk and cookies for Santa. Just think about it, we need coffee to keep us going through these long, dark winter days but Santa flies all around the world in just 24 hours! That guy needs some strong Detroit Bold coffee and so does his reindeer! Coffee is perfect for all occasions, especially during the holidays when your days are spent shopping (imagine black Friday without a little caffeine – yikes), wrapping presents, visiting family, building snow-people, and everything else on your holiday to-do list. Sure, you could drink hot cocoa but that just makes you tired. Instead, you can give yourself (and Santa) that same warm feeling, a bit of energy. So give Santa a BOOST when you give him his cookies with our Baseline – 8 Mile Coffee Blend. He’ll be sure to love our Deep Dark Roast made with our Snickerdoodle Latte Coffee Recipe. 1/2 cup espresso or strong brewed coffee (hot) – for Santa, we suggest our high octane Baseline – 8 Mile Blend or our tasty Christmas Roast. 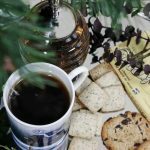 This delicious Snickerdoodle coffee recipe is sure to satisfy Santa’s cookie craving and keep him energized enough to handle all of his Christmas duties. It is also simple enough to make that even your little ones can help you prepare it and set it out for Santa! Send us a message and let us know what keeps you busiest during the holiday season! 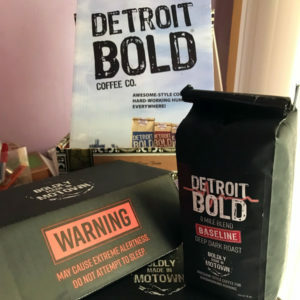 Written by Alasia Pettway – Lover of Detroit Bold & Cookies!